South Africa will formally adopt a national minimum wage of R20.00 per hour on Worker’s Day next year. There are questions as to whether this is enough to be termed a victory for the country’s working poor? If historical trends continue, our research shows that this might be beneficial for some workers. Others, especially those in small firms and rural areas, may not be so fortunate. Workers in rural areas and those currently working in small enterprises could be particularly susceptible to job losses as a result of the national minimum wage. The policy framework acknowledges these vulnerabilities. Its recommendations provide temporary exemption for small employers in particular, but none for rural jobs. That means that workers in rural areas could be adversely affected. We found that most retail jobs were secure after minimum wages were introduced in that sector in 2003. But when we broke this down, we traced many job losses in rural areas. Similarly, many rural farm jobs were destroyed. In addition, if minimum wages continue to be poorly enforced many workers may still be paid wages below acceptable poverty lines. The challenge is that from May 2018, the minimum wage will be imposed across the country in much the same way. It won’t take into account the different conditions under which businesses operate. The result is that some will experience more stress from a minimum wage than others, leading to unintended consequences. With its raging unemployment and many low-paying jobs, South Africa faces a dilemma as it introduces a national minimum wage. Higher wages are necessary for better living standards; but wage growth can potentially exacerbate already high unemployment and consequently reduce living standards. Simple economic models predict that minimum wages destroy employment. However, decades of intense research show that the basic model is not an empirical certainty in all circumstances. Consensus is slowly shifting, with greater recognition for the role of minimum wages in reducing inequality. Latin America is a case in point where inequality was initially extreme, but declined (at least partially) in response to minimum wages at the turn of the century. One might expect the same benefits in South Africa, which has remained close to the top of world inequality rankings. Existing evidence on the potential costs and benefits of minimum wages in South Africa is mixed. With the first formal minimum wages introduced only in 1999, local experience is limited. Traditionally minimum wages have been applied only in certain industries and with special provisions. Variations existed by area and firm size. The effects of a minimum wage on employment are varied, depending on what policies are in place and the economic environment within each industry. Few developing countries have implemented national minimum wages (in other words they are broadly applicable in the same way in all sectors and firm types). This is because informal activity still contributes largely to developing economies. Wages are difficult to regulate in these settings. Nevertheless, countries such as Cape Verde have embarked on national minimum wages in 2014. Overall, economists argue that wage growth is a hindrance to employment creation in South Africa. For example, in better paying sectors (such as manufacturing), wages negotiated by collective bargaining councils have reduced employment by about 10%. But the effects in worse paying, non-unionised sectors are not that obvious. These sectors are typically covered by government imposed minimum wage legislation. Only commercial agricultural enterprises cut jobs when minimum wages were introduced in 2003. Non-agricultural minimum wage jobs, on the other hand, have generally been safer. A national minimum wage therefore has the potential to raise wages without destroying jobs. But we contend that these broad strokes cover up vulnerabilities in vital segments of the labour market. In particular, rurally based and small firms are likely to experience the most stress in response to a minimum wage that covers the whole country in exactly the same way. Our new research shows that employment on large farms grew after agricultural minimum wages were introduced in 2003. In contrast, smaller farmers bore the brunt of minimum wage legislation whose employment levels declined. By all indications, minimum wages displaced workers from vulnerable farms to those that were already doing well. Farming has become increasingly concentrated among large commercial operators over the long-run; minimum wages have contributed to intensify this existing trend. These shifts indicate larger – and not smaller – inequalities in agricultural ownership as a result of minimum wages. Small players must overcome specific challenges - including their wage bill - to remain competitive in local and international markets. Businesses adopt various coping strategies to survive. 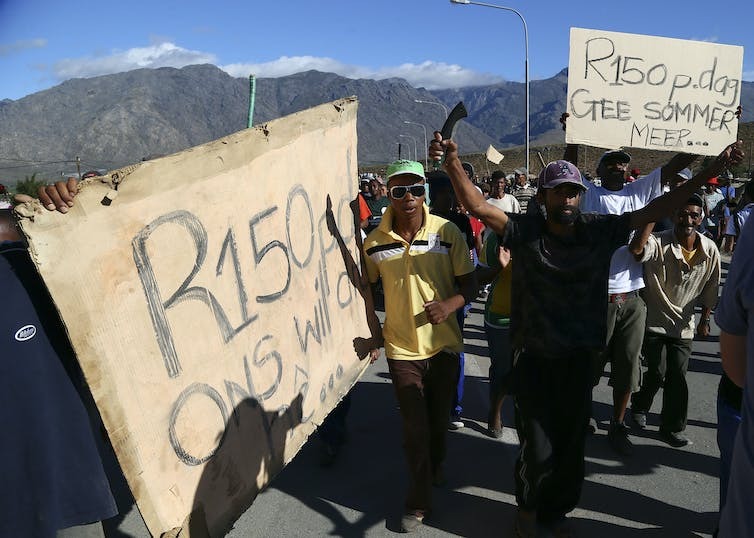 An example of this is the 50% wage increase that followed a strike in the Western Cape at the end of 2012. Surprisingly, no jobs were cut. However, farmers across the country increased their defiance of minimum wages. Many more workers were paid below the legislated benchmark compared to before the hike. Growing non-compliance undermines the central objective of paying a living wage to workers. But this illegal practice appears to keep some smaller players afloat. There was another unintended consequence to the 50% hike in the sectoral wage. Our research shows that agricultural workers who benefited from the wage hike found that other fringe benefits – such as housing and food provision – were cut back during this period. The eventual path from a legislated wage increase to better living conditions is therefore far more complex than one might imagine. While jobs in the retail sector were previously shown to be immune to the imposition of minimum wages, our research shows that the impact isn’t uniform. Workers in urban areas benefited from higher wages and without job cuts. On the other hand, retail jobs in rural areas were cut. As with small players in the agricultural sector, retail operators in areas that are separated from central markets face additional challenges in keeping their businesses viable. Some retailers might raise the prices of their products to afford wage hikes. However, customers in impoverished rural areas are likely to cut back on their purchases. Some rural firms therefore struggle to remain profitable. The evidence suggests that minimum wages are not obviously good or bad for all workers. Some segments of the economy – those already vulnerable – are likely to cut jobs when the national minimum wage comes into full force. Time will tell whether a blanket approach will be effective at increasing the standard of living of vulnerable low-wage workers. Complementary policies to specifically support small and rural firms may be essential for minimum wages to reduce inequality in South Africa.